Mirza Agha Asgari ( Mani ) was born in ۱۹۵۱ in Asad Abad- Hamadan -Iran. 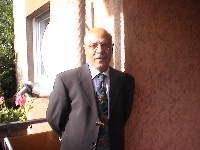 He started his literary activities since his youth when his poems been published in the time media. Mani’s first book of poems was published under the name of -Tomorrow is the first day of world- in ۱۹۷۵ and since then ۴۰ books have been published from his works. Mani also writes literary critics and story. He writes story and poems for children too. Mani immigrated in Germany in ۱۹٨۴ and he is living there since. During this period his literary works been published in Persian and some other languages and at the same time some of his poems and writings been published inside Iran . A book of poems and a story named „ Iranian Symphony been published in German and a story named „ Ever spring land “ for children in Danish. Moreover some of his poems and writings separately been translated into English ,Swedish,Norwegian and Japanese. 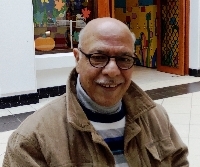 Since ۱۹٨٨, Mani spends his time on literary activities independently, He is the founder and editor of an online publishing named „ Literature&culture “. He is also the member of Writers’ union of Germany . “Where is the key for the desert? - slumbered in the shadow of a pine. “Where is the fragrant portal of this earth? - questioned the old man. - descended into the shadows of sunset. “What happened to the key of love? smoldered in the shadow of a weeping willow. slipped into the shadow of a question. emerged within the desires of childhood. the garden of a thousand questions. ﻧﻮﺍﻯ ﻧﻰﻟﺒﻜﻢ، ﺩﺭﺧﻴﺎﻝِ ﺳﺒﺰِ ﻋﻠﻔﺰﺍﺭ ﮔﻢ ﺷﺪﻩ ﺳﺖ. ﺟﻬﺎﻥ، ﭼﺮﺧﻰ ﺯﺩ ﻭ ﺩﺭﺳﺎﻳﻪﻯ ﺻﻨﻮﺑﺮ ﺧﻔﺖ! ﻧﻴﺎﻓﺘﻢ ﺁﻥ ﭼﻪ ﺭﺍ ﻛﻪ ﻃﻠﺐ ﻛﺮﺩﻡ. ﺟﻬﺎﻥ ﭼﺮﺧﻰ ﺯﺩ ﻭ ﺩﺭﺳﺎﻳﻪﻯ ﻏﺮﻭﺏ ﻓﺮﻭﺷﺪ. ﺟﻬﺎﻥ ﭼﺮﺧﻰ ﺯﺩ ﻭ ﺩﺭﺳﺎﻳﻪﻯ ﺑﻴﺪﻯ ﻣﺠﻨﻮﻥ، ﻛﺰ ﻛﺮﺩ! ﺩﺭ ﮊﺭﻓﻨﺎﻯ ﻋﻘﻞ ﺗﻮﺍﻧﻢ ﻳﺎﻓﺖ. ﭼﺮﺧﻰ ﺯﺩ ﻭ ﺩﺭﺳﺎﻳﻪﻯ سؤﺍﻟﻰ ﻟﺮﺯﻳﺪ! ﺟﻬﺎﻥ ﭼﺮﺧﻰ ﺯﺩ ﻭ ﺩﺭ ﺣﺴﺮﺕِ ﻛﻮﺩﻛﻰ لاﻝ ﻓﺮﻭﻣﺎﻧﺪ! to which I grow accustomed! ﻭ ﻣﺎﻩِ ﮔﺮﻡِ ﺷﺎﻧﻪﺍﺕ ﺑﻪ ﺩريا ﻣﻰﺗﺎﺑﺪ. ﻋﺼﺎﺭﻩﻯ ﺟﻬﺎﻥ ﺑﻮﺳﻪﺋﻰﺳﺖ ﻛﻪ ﺑﻪ ﺩﻫﺎﻥﺍﻡ ﻣﻰﺑﺨﺸﻰ. ﻛﻪ ﺗﺎ ﺍﻧﺘﻬﺎﻯِ ﻫﺴﺘﻰ ﻣﻰﮔﺴﺘﺮﺩ. ﺩﺭﻣﻴﺎﻥ ﻣﻰﮔﻴﺮﻧﺪ ﻣﺮﻭﺍﺭﻳﺪ ﺧﻨﻚ ﺳﻴﻤﺎﻯﺍﺕ ﺭﺍ. ﺍﺯ ﭼﺸﻤﻪﻯ ﺯلاﻝِ ﺗﻦﺍﺕ ﻣﻰﻧﻮﺷﻢ. ﭘﻨﻬﺎﻥﺗﺮﻳﻦ ﻭﺍﮊﻩﻫﺎﻯ ﺍﺳﺎﻃﻴﺮﻯ ﺭﺍ ﺍﺯ ﺩﻫﺎﻥﺍﺕ. ﻛﻪ ﺯﻳﺒﺎﺗﺮﻳﻦ ﻧﻐﻤﻪﻯ ﺟﻬﺎﻥ ﺍﺳﺖ. ﺍﺯ ﺳﺨﻦِ ﻋﺸﻖ ﺷﻔﺎﻑ ﻣﻰﺷﻮﻧﺪ! ﺁﻥ ﭼﻪ ﺩﺭﻛﺮﺍﻧﻪﻫﺎﻯ ﺗﻐﺰﻝ ﺯﻣﺰﻣﻪ ﻣﻰﺷﺪ. ﭼﻨﺎﻥ ﻛﻪ ﺩريا، ﻣﺮﺟﺎﻧﻰ ﺭﺍ ﺩﺭﺧﻮﻳﺶ ﺑﺮﻗﺼﺎﻧﺪ. ﺩﻭﺳﺎﻳﻪﻯ ﺗﻨﻴﺪﻩ ﺑﻪ ﻫﻢ ﺭﺍ ﻣﻰﻟﻴﺴﺪ. ﻧﻘﺸﻰ ﺯﻣﺎ ﺑﺮ ﺍﺑﺪﻳﺖِ ﺷﻦﻫﺎ ﺳﺎﻳﻪ ﮔﺸﻮﺩﻩﺳﺖ! ﺩﺭﺟﺎﻣﻪﻫﺎ ﻭ ﻛﻨﺞ ﻭ ﻛﻨﺎﺭﻫﺎ ﻣﻰﭘﺮﺍﻛﻨﻨﺪ! Sometimes, to remind myself of the value of life, in all its infirmity, I go to a graveyard and I wonder “if the dead could speak, what would they say?” These songs were borne of this thought. I discoursed over a thousand pages! my mouth is filled with soil! not facing but backing away. and on the other the outward. you are lying on a bed that will turn you to ashes! Just as the pit of the fruit is its only existence! I am no longer used to light! the company of the soil. - they are my answer to the world! Still – my reflection remains in the mirror! How bitter to be deposited in strange soil! No! I will not become ashes! from the most remote lands. with the soil of my home? the wet bed of leaves. is nothing but our scattered beauty. fermenting in the wine of the soil. with ripened fruit kiss your mouth. a cradle is not as such! he has suckled the breast of the soil. blooms a bed of flowers! Neither did the orchard of pomegranates, pistachios and grapes. I wrapped the world around me. I were revived, I would rest upon the dew. Even Christ has forsaken me! whose shame is within me! to a woman who loved me! except to die again without regret. a bullet passed through my own! it was for this I killed. It was for death that they did not allow me to live! of a bitter red poppy. هزار گاهى براى آنكه ارزش زيستن را با همه ی نيك و بدهايش فراموش نكنم سرى به گورستان مى زنم. گاه مى انديشم كه اگر مردگان را مجال سخن بود، چه مى گفتند؟ سرودهاى زيرين در اين فضا هستى يافته اند. دهان همه از خاك است! بگاهى كه داعيه ی يقينى داشتم! آينه ئى دو رويه بود. ديگرم با روشنى الفتى نيست! با خود به ميهمانى خاك آوردم. پاسخم به جهان خواهد بود! در آينه ها باقى مانده ست! كه فرو نشسته بر سينه ام. پس اشتهاى خاك را بر نخواهم آورد! بر بستر تر برگ فرا مى گسترم. جز زيبائى پراكنده ی ما نيست. پيمانه ئى سرشته ز خاك ماست! سنگ و عقرب و خاموشى. چركدانه ی باران بر دهانش. باغ انار و پسته و انگور نيز. با كوه هايش، جارى الماس و ياقوت. چه تنگ بود مرا دنياى فراخْ دامن! در مشت خويش مى فشرد! خانه ام ديار به ديار جارى بود. جمال جهان را اگر كه نوشيدم. مرده ئى گمنام نام نهاديد! مسيح نيز فراموشم كرده است! نام مرا به خاطر دارند!
" بكش تا زنده بمانى!" و گلوله ئى از پيشانى ام گذشت! اگر كه نگذاشتند تا بزيم! از شعله ی شقايقى تلخ مى سوزد! The sheen of wet moss. My soul is always a gushing fountain!! But I kneel before you. I would lay them all at your feet! ﭘﻴﺶ ﭘﺎﻯ ﺗﻮ ﻣﻰ ﻧﺸﻴﻨﻢ! ﭘﻴﺶ ﭘﺎﻳﺖ ﻓﺮﻭ ﻣﻰ ﺷﻜﻨﻢ! Love is the last thing that saves you. At noontime in the garden. Yet, ships do die in the sea! For mankind dies in frozen beliefs ! ﻛَﺸﺘﻰ ، ﺑﻰ ﻣﻌﻨﺎﺳﺖ . ﻭ ﺍﻫﻞِ ﺯﻣﻴﻦ ﻣﻰ ﺷﻮﺩ! ﻭ ﺑﺎﻝ ﻣﻰ ﮔﺸﺎﻳﻢ !